During the 2016 campaign trail, President Trump repeatedly asserted that vaccines are linked to autism. "We've had so many instances - people that work for me just the other day, 2 years old, 2 1/2 years old. a child, a beautiful child went to have the vaccine and came back a week later got a tremendous fever, got very sick. Now he's autistic," President Trump said. This statement prompted a swift outcry from the medical community denying this claim. Alison Singer, the President of the Autism Science Foundation, said it's not just the President of the United States who has this view. There are thousands of people who don't vaccinate their children. According to the World Health Organization, around 40,000 people were diagnosed with measles in Europe in 2018 alone. Singer points to the public's distrust of vaccines as the reason. But, she emphasized that not vaccinating your child could have serious repercussions. "Once you put that scary idea into peoples minds that maybe vaccines cause autism it's very hard to get that scary idea out of their minds," Singer said. "So, the result is parents started withholding the MMR vaccine from their children." So, how did this debate all get started? In 1998, physician Andrew Wakefield published a research paper in The Lancet that alleged a the link between the Measles, Mumps and Rubella (MMR) Vaccine and being autistic. It was later found that Wakefield had manipulated evidence from the study. The research paper was eventually completely retracted in 2010, but its publication has had lasting repercussions. Singer thinks this controversy shouldn't even be a debate at all. "The question of whether or not vaccines cause autism is a question that science can answer," Singer said. "Science has answered it, and the answer is no. Vaccines don't cause autism." Gayle DeLong isn't too convinced. DeLong, an associate professor of economics and finance at Baruch Collge, published a research paper in 2011 once again alleging a link between vaccines and autism. DeLong said she was discouraged by some of the criticism her paper received. "Some people were saying, 'well, vaccines don't cause autism.' Yet, there's so much research out there that says there's a possibility," DeLong said. DeLong has two daughters who are on the spectrum. In 2014, she wrote an article in the Age of Autism, where she coined the term Autism Induced Breast Cancer, where she asserts her breast cancer was caused by raising two children with autism. No scientist or medical professional has used having autistic kids as a possible indicator of breast cancer. DeLong didn't attend medical school. Before embarking on her research, she hadn't conducted any previous scientific studies. Even still, DeLong said her resolve is only strengthened when she sees the growing number of autism diagnoses each year in the US. According to the The Centers for Disease Control and Prevention, 1 in 59 children who are around the age of 8 have been diagnosed with autism. DeLong said more people should be open to considering the possibility that vaccines cause autism. "People say that we can't stop vaccinating, because then all these horrible diseases will come back," DeLong said. "Many of the horrible diseases, and they truly are horrible - dysphoria is horrible, whooping cough is horrible. Many of the diseases were already on their way out before vaccines were introduced." 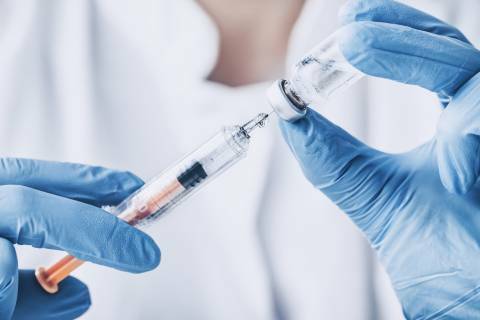 The CDC published a statement last year, saying that the rise in autism isn't due to the number of vaccines children are getting. It's because doctors are getting better at screening children for autism. Dr. Jane Zucker, the Assistant Commisioner at the New York City Department of Health, said the Internet is part of the problem. Zucker says it gives people who don't vaccinate their children, known as "Anti-Vaxxers", more credibility than they should have. When Zucker is advising parents about vaccinations, she says she has them look at reputable websites and articles. "Unfortunately, you can go on the Internet and find a lot of incorrect vaccine information very quickly. It's often what comes up first on the google search. But I try to steer them towards reliable information do they can read for themselves." Zucker points to the CDC, the World Health Organization and dozens of peer-reviewed journals that assert vaccines have never, and will never, cause autism.